TEG’s annual Marketplace is a unique opportunity for all those working in touring exhibitions to get together to network, discuss projects and exchange ideas. 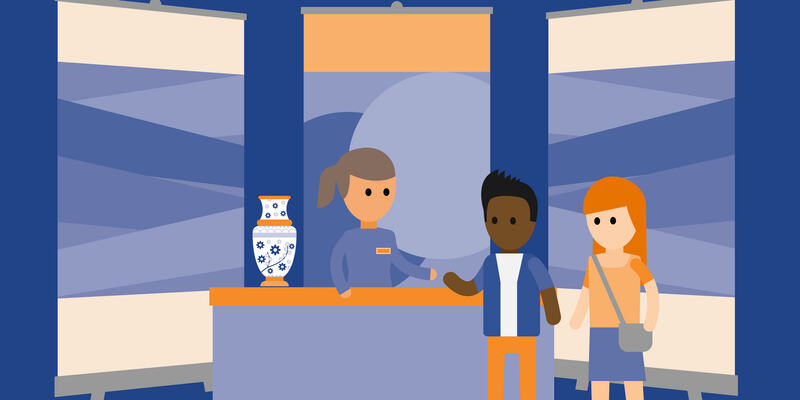 Delegates can book a stand to distribute details about their available exhibitions and partnership opportunities, or circulate freely to network. Join colleagues nationwide for one or two days of networking and inspiration at the UK’s principal touring and partnership exhibitions networking event. Tour 1: A tour at Birmingham Museum and Art Gallery by Exhibitions Curator Katie Morton that will include an introduction to the recently revealed replica of an Anglo Saxon ‘king’s’ helmet in the Staffordshire Hoard. There will also be the chance to see the exhibition ‘Too Cute: Sweet is About to Get Sinister’, curated by contemporary artist Rachel Maclean. Tour 2: A tour of Minerva Works in the Digbeth area of Birmingham. Minerva Works comprises a small industrial estate located on a site which is made up of 21 units currently occupied by a range of tenants including artist-led initiatives Grand Union Studios, Vivid Projects, Stryx collective, Harris Moore Canvases with artist materials shop and online canvas supply and Birmingham’s aerial theatre company RoguePlay Theatre. The tour will include visits of 20 minutes to independent arts organisations Grand Union, Vivid Projects and Centrala. This year’s seminar will explore how to commission creative content, graphic design and exhibition build and infrastructure to tour. It will look at the imaginative, practical and contractual steps involved in commissioning artists, writers, poets and other creatives, as well as graphic and exhibition designers, to help you get the most out of these relationships. TEG will launch and introduce it’s new commissioning agreement template and resource. Speakers will include Brian Cass, Senior Curator Hayward Touring, Matt Windle, Poetry with a Punch (Birmingham Poet Laureate), Jessica Litherland, Visual Arts and Media Producer, MAC, Emma Daker, Exhibitions and Project Development Manager, Craftspace, and Juneau Projects. Our popular 5 Minute Share is an opportunity for delegates to present information about upcoming tours, loan or partnership projects, to ask for input or find partners; presentation slots are allocated to delegates on a first-come-first-served basis, after booking. Opportunity to see the exhibition Cyber Grrrl – an exhibition by art collective CyberTwee. The Berlin and US based collective are transforming BOM’s gallery into a beautiful oasis inspired by Sci Fi and Donna Haraway’s The Cyborg Manifesto essay. TEG’s annual Marketplace is a unique opportunity for organisations developing for supporting the development of touring and partnership exhibitions to network, discuss projects and exchange ideas. Delegates can book a stand to distribute information about their opportunities and services, or circulate freely gather information and discuss collaborations. 09.30-10.30 – Tour of Leonardo da Vinci: A Life in Drawing at Birmingham Museum and Art Gallery by Exhibitions Curator Katie Morton (registered delegates will be sent booking information – places reserved on a first come first served basis). (registered delegates will be sent booking information – places reserved on a first come first served basis). Tours will be offered during the afternoon – full details and times tbc.